“BED and breakfast-style accommodation is becoming increasingly popular and there are a wide range of options available. 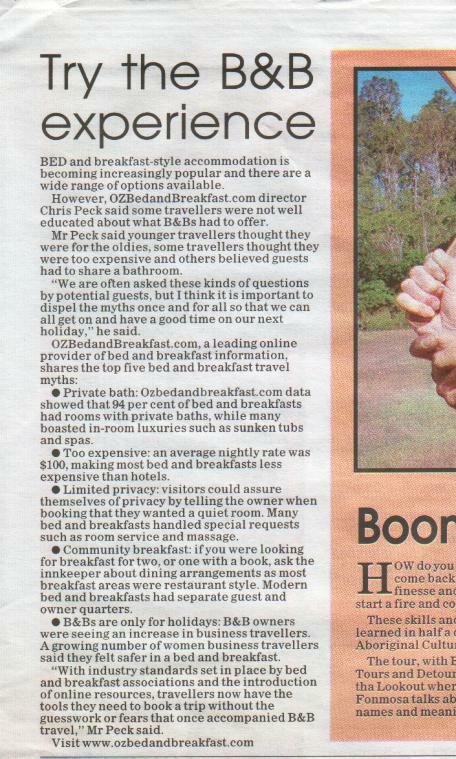 However, Ozbedandbreakfast.com director Chris Peck said some travellers were not well educated about what B&Bs had to offer. Mr Peck said young travellers thought they were for the oldies, some travellers thought they were too expensive and other believed guests had to share a bathroom. “We are often asked these kinds of questions by potential guests, but I think it is important to dispel the myths once and for all so that we can all get on and have a good time on our next holiday,” he said. · Limited privacy: visitors could assure themselves of privacy by telling the owner when bookings were made that they wanted a quiet room. Many bed and breakfasts handled special requests such as room service and massage. · Community breakfast: if you were looking for breakfast for two, or one with a book, ask the innkeeper about dining arrangements as most breakfast areas were restaurant style. Modern bed and breakfasts had separate guest and owner quarters. · B&Bs are only for holidays: B&B owners were seeing an increase in business travellers. A growing number of women business travellers said they felt safe in a bed and breakfast. “With industry standards set in place by bed and breakfast associations and the introduction of online resources, travellers now have the tools they need to book a trip without the guesswork or fears that once accompanied B&B travel,” Mr Peck said.